Fondant cake designs can be smooth and simple or elaborate and elegant. This icing's smooth, dough-like texture makes it an ideal medium for cake decorating creativity. A smooth, fondant cake is beautiful even without extensive decorations, and fondant is a popular choice for wedding cakes. If you want to create more unique cake designs, however, you're only limited by your imagination. Take a look at the many ways fondant is used. Simple fondant flowers made from circle and teardrop shapes make it easy to decorate a small, festive cake. Cut shapes by hand or with cookie cutters, and apply them to a smooth fondant base. Finish the design with a coordinating ribbon around the base of the cake to pull the color palette together. Fondant is a malleable, useful material for sculpting lifelike flowers to decorate any special occasion cake. The more detailed these flowers are, however, the more expensive such a cake design can be, and it is important to consider that price when budgeting for a special dessert if you don't plan on decorating the cake yourself. 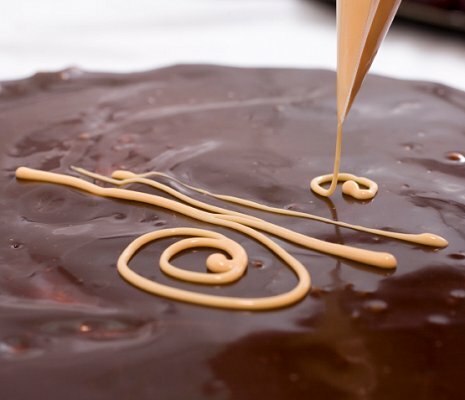 Due to fondant's smooth texture and ability to be folded and molded, it's frequently used for ribbon cake designs. This is an especially popular technique used to make square cakes look like gifts for anniversaries, graduations, Valentine's Day, and more. Adding extra fondant details and beading creates more elaborate designs. Fondant ican be molded into many different textures, often for the same cake. One tier may be decorated with stripes while another is adorned with swags. Other options include fondant flowers, polka dots, quilting, or small dots. Bold stripes and designs can be created out of fondant by cutting out the same shapes from two different colors of icing and interchanging them. This can give you a unique cake design without sacrificing the smooth texture of the icing. Pressing a quilted pattern into the fondant is a great way to add texture to the icing. Adding small beads at each intersection of the quilting pattern further embellishes the design and conceals any ragged corners. Fondant cutouts of fall leaves are popular designs for autumn cakes. Small quantities of fondant can be dyed in different fall foliage colors, or one color can be used for a uniform cake design. The leaves can even be carefully folded to follow the curves and creases of a cake's tiers. Stenciling is a popular technique to use with fondant icing because the fondant provides a smooth, firm base. The stencils can be airbrushed or may be piped on the cake, depending on the baker's skill. An airbrushed stencil can also be augmented with some textured details. Also important to note, black icing doesn't "bleed" into fondant the way it does on buttercream icing, so fondant is the perfect medium when you want to create an elegant black and white cake design. Piping patterns is one of the most popular techniques used to decorate fondant cakes. Squiggles and swirls are easy to create, and more elaborate techniques include adding monograms, initials, or stylized patterns. Using fondant makes it easy to create themed cakes rather than abstract designs. For example, a spring hat cake may use ribbons, beads, and flowers; this highlights different fondant techniques in the same cake design. Chocolate fondant is a decadent treat that pairs well with chocolate-covered strawberries or other fruits. White chocolate piping details add more delicious elegance to the cake's design. Fondant can be cut into letters and other shapes, and allowed to dry. You can then use these pieces to create a coordinated cake topper. Since fondant can be more challenging to work with than buttercream icing, it is often reserved for holidays and special occasions. For example, a winter holiday cake like the one shown here is created by covering the cake with fondant, and then using a cookie cutter to cut the snowman figure from rolled white fondant. The the snowman is then applied to the cake, and the details are piped on with buttercream icing. Mixing different types of patterns on a cake, such as swirls, dots, and abstract flowers, gives the design dimension and elegance. Fondant shapes can be layered for even more texture, and similar shapes can be used on alternating tiers of a large cake to coordinate the design while adding more visual interest. Larger fondant-covered cakes look elegant with graceful, flowing trails of vines and flowers along the edge of each tier. This is a popular design for wedding cakes, and the flowers and colors can coordinate with the real blooms used in centerpieces and bouquets. A topper made of fondant flowers adds a luxurious and coordinated finish to this design. Not only can fondant be applied to a cake and airbrushed with soft, gradual colors, it can be molded into whimsical figures for the top of the cake. This moon and teddy bear cake is perfect for a baby shower or child's first birthday, and you can make different figures for various occasions. Fondant can be dyed to match school colors for a festive and congratulatory graduation cake, and coordinating school accent colors can be piped onto the cake in swags or swirls. However, fondant is not the sweetest icing, so to cater to young graduates with a sweet tooth, consider adding buttercream accents or cupcakes with sweeter buttercream icing. Cover a character-shaped cake in fondant for a flawless look. If necessary, break the fondant up into sections and add details to hide the seams. Fondant adds a polished finish to a shaped cake that you may not be able to achieve with buttercream and a decorating spatula. Fondant offers a smooth surface that is perfect for showing off artistic skills. Use piping gel to paint a design onto the top of a single tier cake. You could also use an icing airbrush to add design elements to your cake. Since fondant is so versatile, why not create an outrageous design that combines as many fondant techniques as possible? A cake that's this bold, yet amazingly beautiful, is bound to be noticed no matter what the occasion might be. However, it would be an especially fun design for the ultimate birthday cake. The key to becoming skilled with fondant is to start small. Practice rolling it out and covering single layer cakes, and play around with creating flowers, figures, and embellishments like swags. The more you work with fondant, the more confident you'll become decorating cakes with it. After that, the sky is the limit for your unique designs.